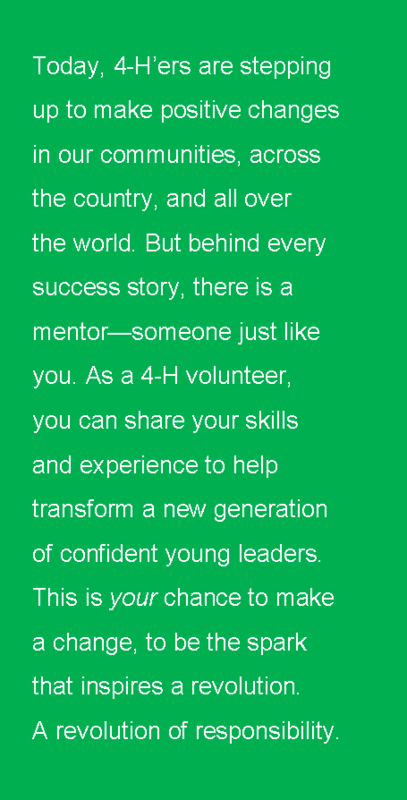 Become a 4-H Volunteer today and help create life-changing experiences for youth in your community! Share your skills and expertise with youth in Ozaukee County. Whether you would like to lead a project, coordinate a countywide activity, or be an officer in your local club, there’s a place for everyone in 4-H. For more information, contact the 4-H & Youth Development Educator in Ozaukee County, or join us at a Leaders Association Meeting. Our 4-H Leaders Association meetings are held 10 times a year on the 3rd Thursday of the month at 7:30 pm. The location rotates between the Administration Center Auditorium in Port Washington and in Cedarburg at the Ozaukee Pavilion. The intent of the meetings is to keep all clubs and those involved in the program up-to-date, as well as allow your voice in how we do things, decisions on the events, planning, and preparing for events. Our Association is more than just the 2018-2019 Board of Directors and General Leaders. It is 4-H as a whole and we encourage everyone’s involvement to make things happen. The Leaders Association will meet in October to complete their board reorganization. Committees will be appointed and we are looking for additional members from the Association to help serve on these committees. Please take time to review the list and see if there is something that you may have an interest or hidden talent that could strengthen the committee and what a better way to give back to your favorite organization by giving of yourself to help better others. We could use an additional 2-3 people on each of the above listed committees. If you have an interest in serving on one or several of these committees, please contact Kathy Butler at 262-284-8288 (kathy.butler@wisc.edu). We welcome all new volunteers and thank you for your willingness to serve in this capacity. 4-H takes steps to ensure a safe and healthy environment for youth and encourages safeguards for adult leaders. Each new volunteer is required to attend one volunteer orientation. New Volunteers should register as a Volunteer through 4honline. For more information, please contact the 4-H and Youth Development Educator, Kathy Butler at kathy.butler@ces.uwex.edu. If you enjoy working with teens, collaborating with others as part of a unified leadership team, and experiencing another part of the country, consider applying to serve as an Adult Advisor to Space Camp, Huntsville, AL; Citizenship Washington Focus (CWF), Washington, D.C.; or National 4-H Congress, Atlanta, GA. Please watch the Harbinger for information. Applications are normally due in February.